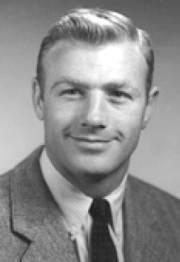 Nebraska was the first stop in the head coaching career of Pete Elliott, a former Michigan quarterback who in 1956 became the youngest head football coach in modern NU history. Elliott was on Bud Wilkinson's staff at Oklahoma when he was hired at age 29 to succeed Nebraska's Bill Glassford. After a 4-6 season at Nebraska, Elliott moved on to Cal-Berkeley, and an assistant he had brought to Lincoln from Norman, Bill Jennings, would move up to replace him as NU's head coach. During Elliott's second season at Cal, he guided the 1958 team to the Rose Bowl — the Bears' last appearance there to date. In 1960, he took the top job at Illinois. Just one season after the Illini broke out of a 15-game losing streak, the 1963 team earned the conference's Rose Bowl berth. Elliott thus became the first coach to lead teams from both the Big 10 and Pacific conferences to the Pasadena classic. His years at Illinois also included an annual tussle against his alma mater, Michigan, coached by his older brother, Chalmers "Bump" Elliott. Bump bested Pete in the series, 6 games to 1. Pete Elliott's tenure at Illinois ended with his resignation amid a player slush-fund scandal that brought sanctions on the school's football and basketball programs. Elliott always maintained that any money given to football players was not a recruiting inducement but was merely to help players in need after they were already enrolled. Elliott later became associate athletic director at Miami of Florida. When the head coaching job there became vacant in 1973, he stepped in and coached for two seasons, then returned to administration. His replacement as head coach: former Nebraska assistant Carl Selmer. Elliott later rejoined his good friend Wilkinson as an assistant with the NFL's St. Louis Cardinals. From 1979 to 1996, Elliott served as executive director of the National Professional Football Hall of Fame in Canton, Ohio. An outstanding multi-sport athlete, Elliott was named a football All-American after Michigan's 1948 national championship season and earned a record 12 athletic letters in Ann Arbor — four each in football, basketball and golf. He was an all-Big 10 guard in basketball and was runner-up in the Big 10 golf championship in 1948. He was inducted into the College Football Hall of Fame in 1994.